We support Unity version 5 and up. In case using XCode version lower than 9.3, we suggest archiving with ‘bitcode‘ disabled. The download, use and access to the SDK is subject to the ironSource Mobile SDK Publisher Online Terms & Conditions. If you do not agree to the terms of ironSource Mobile SDK Publisher Online Terms & Conditions, do not download, access, or use the SDK, or the underlying services. When upgrading from older SDK versions to the ironSource SDK 6.7.0 and above, you must update all mediation adapters. Make sure your Unity project is opened and import the Unity package. 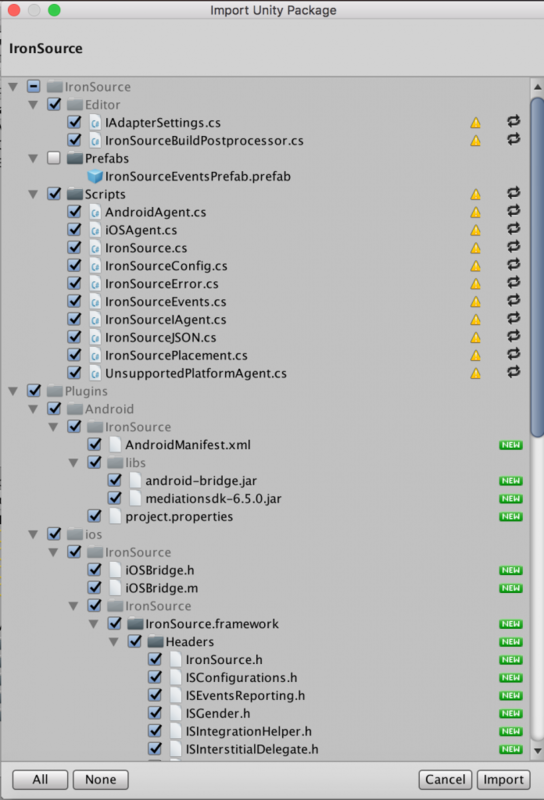 The ironSource SDK is designed to work with the Android & iOS platform. The Unity Editor contains a Simulator to work with Unity code. 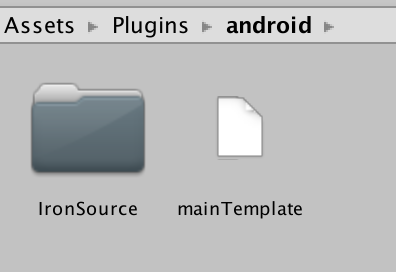 In order to work with our plugin, you must target either an Android or iOS build to test the integration. Make sure you integrate Google Play Services correctly. ironSource Mediation SDK only supports google-play-services up to version 17.2.0, please do not integrate any higher version. Download the support-v4-[version].jar. Add the jar to your project under App/Libs. Go to app’s gradle and change the google play services version to the one you want (not higher than 17.2.0). ironSource SDK requires google play services Basement and google play services Identifier, while other networks may also require additional google play services. For additional information, follow this guide on how to integrate the Google Play Services AAR. Our Unity Plugin usually adds all the required frameworks automatically. In some cases, the AdSupport.framework can’t be added automatically using Unity 5. Verify if the framework has been added and in the case it has not been added automatically, make sure to add it manually. Add in a dictionary called ‘NSAppTransportSecurity‘. Make sure you add this dictionary on the ‘Top Level Key‘. Inside this dictionary, add a Boolean called ‘NSAllowsArbitraryLoads‘ and set it to YES. Note: Make sure that your info.plist does not contain any other exceptions besides ‘NSAllowsArbitraryLoads‘, as this might create a conflict. ironSource supports optional SDK settings such as UserID and Segments that must be configured before you initialize the SDK. See our guide on Additional SDK Settings for setup instructions. Note: If you’re serving the Offerwall ad unit or using server-to-server callbacks to reward your users with our rewarded ad units, you must set the UserID. First, you’ll need to pass the state of the application by executing the following event function during the Application Lifecycle. You can initialize the plugin in two ways. We recommend the first method as it will fetch the specific ad units you define. New! When using this init approach, you can now initialize each ad unit separately at different touchpoints in your app flow in one session. For more details on the ironSource Integration Verification tool navigate to this article. You are now ready to start working with ironSource’s Ad Units and Mediation Tools. Interested in Mediation? Integrate our Rewarded Video or Interstitial Ads in your app and follow our Mediation articles.